« Tips for Saving Money at the Movies ~ Don’t Let the Summer Blockbuster Turn Into a Bank Buster! These 3 FREE Short Stories for Your Kids Just Might Change Their Lives Forever! Adventures in Wisdom Announces a Movement to "Empower 1 Million Kids"
Kids are learning their ABCs and 123s, but they aren't learning the one thing that has the greatest impact on their happiness, confidence, and success in life - it's their mindset. Now there is a quick, easy, and fun way to get the conversation started with the Empower 1 Million Kids movement. "Our children's mindset is how they choose to think about themselves, the world, and what is possible for their lives," shared Renaye Thornborrow, founder of the Empower 1 Million Kids movement. "The good news is that mindset skills can be developed and we want to help start the conversation by encouraging parents and mentors to take just 10 minutes a week, over the next three weeks, to share a fun short story with the kids in their lives. The stories are free but the skills are priceless." With each story, kids learn a powerful mindset skill for creating confidence, choosing happiness, and achieving their goals. During the first week, kids learn about "self-talk" and how to use this skill to create powerful self-confidence and self esteem. During the second week, they learn about "power shifting" and how to use it to create happiness in their lives and to feel empowered when things don't go their way. And during the third week they learn about the power of "visualization" and how to use it to "train their brain" to achieve their goals. Taking just 10 minutes to share these stories with kids will enable them to learn powerful skills that will last a lifetime. Parents, teachers, grandparents, and mentors can start closing the gap and empowering their kids today by signing up for their free stories at www.Empower1MillionKids.com. Based in Austin, Texas, Adventures in Wisdom is a breakthrough life coaching program for mentoring kids that uses short stories and activities to teach children ages 6-12 how to develop a mindset for powerful self-esteem and self-confidence; achieve their goals; handle challenges such as fear, failure, and peer pressure; and create happy fulfilling lives. Kids learn over 25 personal development skills via skill books or audio programs that can be completed while at home or in the car. For more information call 860-580-WISE or visit http://www.AdventuresInWisdom.com. Best Holiday Season Cookies? 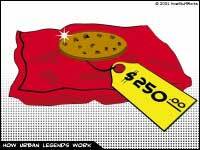 Without a Doubt, It’s the $250 Neiman Marcus Cookie Recipe!